Ray was born on August 7, 1942, in Goodman, son of the late Raymond and Susan (Glass) Gordon. He was a graduate of Goodman High School later attending Technical College to become a Mechanical Draftsman. Later in life he was a self employed Logger which allowed him to enjoy one of his favorite things; the outdoors. In his spare time Ray enjoyed hunting, fishing and his true passion of making Uncle Gordy's Maple Syrup in his Sugar Shack in Goodman. Ray loved spending time with family and friends at his camp in Fence, WI. 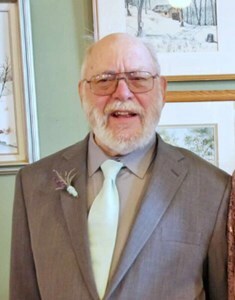 Ray served on the Wausaukee Village Board, enjoyed attending high school sporting events, and his latest passion of making signs and jewelry boxes. He was a loving husband, father, grandfather and friend who will truly missed. He will be greatly missed by his by his wife Sandy, and their two children: Corey (Jaime) Gordon and Hailey (Nick) Douglas. He also leaves his siblings: Sandra Toth, and Judy (Mike) Cassidy along with In-laws: Liz Gordon, Carol (Jim) Brady, Gary (MaryKay) Gordon, Bruce (Holly) Bergner, Jeff (Dori) Bergner, Joan Fletcher, and Joseph (Jody) Bergner. Raymond also leaves his beloved grandchildren: Bowen Gordon and Oaken Douglas, along with numerous nieces, nephews, extended family and friends. He is preceded in death by a sister, Patricia Gordon, and a brother, William Gordon. A visitation will be held on Saturday, February 2, 2019 from 2 PM - 5 PM at Newcomer - Green Bay Chapel, 340 S. Monroe Avenue, Green Bay. A service celebrating Ray's life will follow at 5 PM in the funeral home. To leave a message of condolence or memory from Ray's family, please click the Share Memories button above. Add your memories to the guest book of Raymond Gordon. I will miss our conversations about the the "Goodman Timber" old days and all the updates. I knew Ray for 50 + years because of my families store, but I also remember his parents (store and the mill). All good people. My you all rest in peace. Sandy, we were so sorry to learn of Gordy's untimely passing. What a shock for you and your family. We all have fond memories of him at the DeKeyser family reunions. Uncle Gordy's Maple Syrup was a staple in our household. We are keeping you in our thoughts and prayers at this most difficult time. I am so sorry to hear about your loss. Praying for you and your children during this difficult time and sending my heartfelt sympathy. Sending our deepest sympathies. We are so sorry to hear of Ray's passing. It was a pleasure working with Ray on the Goodman Sanitary District for many years. He will be deeply missed.